A kind friend (above-referenced) pointed out that I’m quite keen to blog about the process, but not so good on posting results. That is, of course, because I’m rather judge-y about my results, and more so about my photographic abilities. 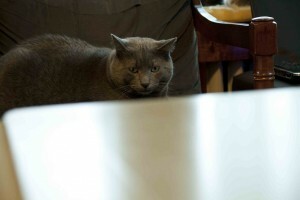 But it’s the holidays and Ben (of the manly chest of drawers update) is here with his camera and his mad skillz. Yay, Ben! 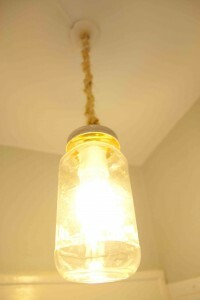 Originally, I had a blue jar as the shade, but found that in this dark corner of the kitchen, we needed every bit of white light we could get, so I replaced with a clear jar. I bought pasta sauce expressly for the dimensions of the jar! 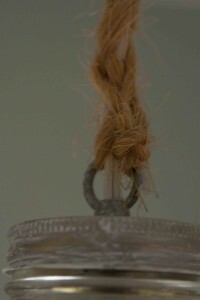 I also braided twine around the cord as shown by Kara Paslay’s Mason Jar Pendant tutorial. What a difference a window makes! We chose a door with a half-lite to brighten things up. 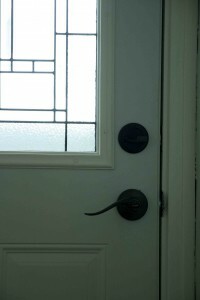 It’s a different brand than our front door, but has a similar pattern in the glass (although the front door glass is smaller). It gives us some continuity, but more daylight. Such as the daylight is this time of year. 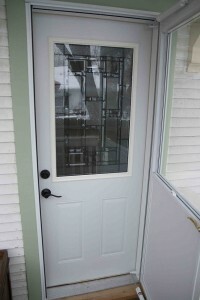 We updated the storm door as part of the same project, and we love it. Picked this photo because you can see a peek of our holiday construction paper projects — they make me grin. 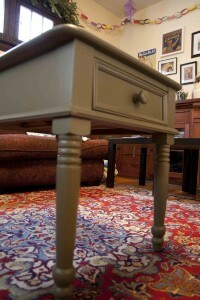 I wanted to add that I used spray-can water-based spar polyurethane for the top of this table, and it has been great! I did three and a half coats — the can ran out halfway through the fourth coat. No brush strokes, but still a strong finish. Quality Inspector Inigo checks out the finish. The paint store guy said it was impossible to achieve good protection with a spray formula. That might be true outdoors, but even for an oft-used piece of furniture, I’ve been pleasantly surprised. New year’s resolution: post more after pictures! This entry was posted in Before & After, Decor, Furniture, Repair & Maintenance, Windows & Doors and tagged mason jar light, painted furniture. Bookmark the permalink.